Author: MacQuarrie, Kim Set In . . . Description: The epic story of the fall of the Inca Empire to Spanish conquistador Francisco Pizarro in the aftermath of a bloody civil war, and the recent discovery of the lost guerrilla capital of the Incas, Vilcabamba, by three American explorers. In 1532, the fifty-four-year-old Spanish conquistador Francisco Pizarro led a force of 167 men, including his four brothers, to the shores of Peru. Unbeknownst to the Spaniards, the Inca rulers of Peru had just fought a bloody civil war in which the emperor Atahualpa had defeated his brother Huascar. Pizarro and his men soon clashed with Atahualpa and a huge force of Inca warriors at the Battle of Cajamarca. Despite being outnumbered by more than two hundred to one, the Spaniards prevailed—due largely to their horses, their steel armor and swords, and their tactic of surprise. They captured and imprisoned Atahualpa. Although the Inca emperor paid an enormous ransom in gold, the Spaniards executed him anyway. The following year, the Spaniards seized the Inca capital of Cuzco, completing their conquest of the largest native empire the New World has ever known. Peru was now a Spanish colony, and the conquistadors were wealthy beyond their wildest dreams. But the Incas did not submit willingly. A young Inca emperor, the brother of Atahualpa, soon led a massive rebellion against the Spaniards, inflicting heavy casualties and nearly wiping out the conquerors. Eventually, however, Pizarro and his men forced the emperor to abandon the Andes and flee to the Amazon. There, he established a hidden capital, called Vilcabamba—only recently rediscovered by a trio of colorful American explorers. 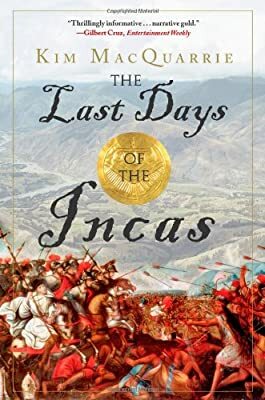 Although the Incas fought a deadly, thirty-six-year-long guerrilla war, the Spanish ultimately captured the last Inca emperor and vanquished the native resistance.